Get in touch for more information. Like us on Facebook, follow us on Twitter, watch us on YouTube, email us to say hello. 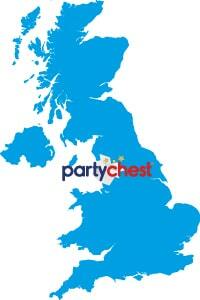 Have a Play Chest® Party? If you currently have a Play Chest® Party Experience and you require assistance then please contact us on 01253 462628 and leave a voicemail. We shall return your call as soon as possible. This service is available between Monday-Sunday 9am-6pm.